Faraway Press: The Online Home of John Jackson Miller: Overdraft: The Orion Offensive Episode 1 available today! 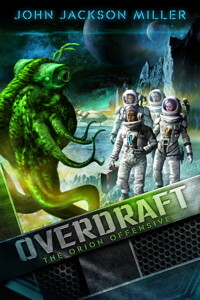 Overdraft: The Orion Offensive Episode 1 available today! It's OOO-Day! Today, "Greenmail," the first episode of my new Kindle Serial, Overdraft: The Orion Offensive, goes live and is available to download. Wahoo! In Part 1, we meet conniving desk-trader Jamie Sturm, the 22nd Century equivalent of a hedge fund manager. He's blown through a huge amount of his firm’s money, putting an entire interstellar expedition at risk. But the swindler is surprised when the armored security team arrives to take him back to the stars to get their money back, one dangerous alien encounter at a time! It’s space-trading space opera with a military SF bent, set in the 22nd century universe I introduced in “Human Error” in last year’s Armored anthology from Baen Books. There’s no instantaneous communication in the “Whirliverse,” so commerce is very much more like it was during the time of the East India Company, which was my inspiration. And there’s a size limit to interstellar transportation, which literally changes the shape of once-familiar starships: everything's modular. It’s stellar travel in the Age of Rail — seasoned with a lot of the fun interplay I like to employ in my writing. Overdraft is a Kindle Serial published by 47North. It's a full-length novel, delivered 12,000+ words at a time every two weeks until it's finished. One $1.99 price gets them all. Q. How many episodes do I get for my $1.99? A. As stated, all of them! Every one that's been released in the storyline to date (which, today, is one). Q. What formats is the Kindle Serial available in? A. The Kindle Serial is, as its name implies, exclusive to Kindle users, but Kindle-reading software is available for many devices for free: Mac, PC, Android, Blackberry, Windows Phone, etc. I just downloaded a copy to my personal computer using one of the apps. Click here to download a wide range of free Kindle Reading Apps . The eventual physical book will be available through BN.com and wherever books are sold. I'll post links and the ISBN number then. Q. How long is the $1.99 pricing good for? A. Until the serialization period ends — which would be a date sometime this summer. At that point, new purchasers will get the full ebook at regular ebook pricing — or can choose the physical trade paperback, which will be made available at the same time at regular trade paperback pricing. I'll be posting more related content here in coming weeks — and there's a forum set up on Amazon you can also ask questions in. Always happy to answer questions here, as well. You can post reviews at any time during the serialization period. Thanks, and enjoy the ride!